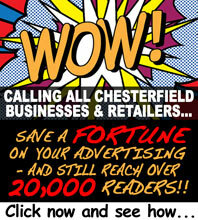 One of Chesterfield's newest, and most popular events is now just days away from opening. 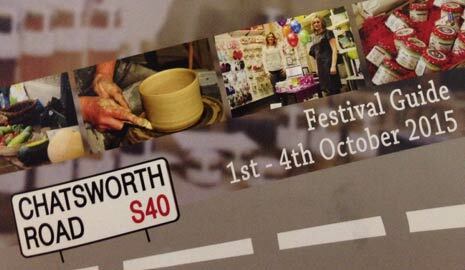 Months in the planning, the hugely popular Chatsworth Road Festival - now in it's fifth year - starts this week, and the four-day event will once again be crammed full of activities to suit all ages. In fact it's so anticipated that would-be visitors are advised by organisers that some activities are already sold out but for many, it's just 'turn up on the day'. Chesterfield's Mayor, Cllr Barry Bingham, will officially open the festival at 09.30 on Thursday 1st October at St Thomas' Church, with heavy rock band, Spitfire, the last performers on the Sunday evening. The Sunday will have a real festival buzz about it as live music is staged at ten different venues - all are free to attend so why not plan your own timed route? For those who have been before, organisers say that it is slightly different this year, having been shortened to four days to provide a tighter focus and a more concentrated period of activity. However fewer days has actually meant MORE events with over 120 varied activities, promotions and competitions scheduled. This festival differs from others in that it doesn't feature a fun fair, 5-a-side football or marching bands - instead it aims to more widely promote businesses and organisations based on or near to the ever-more vibrant Chatsworth Road in the West of Chesterfield. The area is a real gem with great pubs, restaurants and an eclectic mix of shops that sell everything from wellingtons to wedding dresses and fantastic pottery to fairtrade coffee. 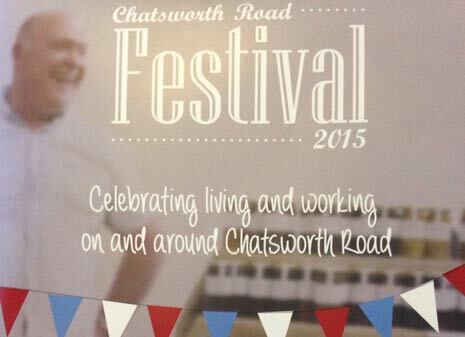 The Mayor of Chesterfield, Cllr Barry Bingham, will officially open the Festival at 'both ends' of Chatsworth Road on Thursday 1st October. At 9.30am he will mark the opening by putting up some bunting at St Thomas' Church before moving on to the Carers Centre on West Bars for the start of their 'Best Breakfast' event at 10.00am. Derbyshire's Poet Laureate, Helen Mort, will pop to the Real Ale Corner early evening on Friday to share her verse. The Brampton Food Market (10.00am on Saturday 3rd) celebrates its 4th birthday and hosts various 'pop-up' Festival stalls from apple pressing to seed swapping. The Festival 'Char Challenge' will see local tearooms vie for the title as a mystery shopper gives their preference. Sunday Sounds will add some volume as nine venues offer live music on the 4th October from lunch to late. It's sure to be a busy weekend - and event organisers say everyone will be made very welcome.